I’ve been asked by Kallo to be their soya expert for their new range of Organic Soya Drinks. Reviews of my new book! Waitrose Weekend magazine calls my new book “Simply delicious”, and Vegetarian Living and Taste Italia have run extracts of recipes “that the whole family can enjoy”. My new book has been published! 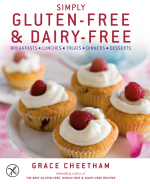 My new book, Simply Gluten-Free & Dairy-Free has hit the shops! 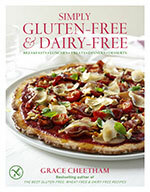 Feel Good Food Autumn 2010 has recommended my book, The Best Gluten-Free, Wheat-Free & Dairy-Free Recipes.